Red Stag Casino has been in the online casino game since 2015. However, they have performed like a casino that has been around for a decade. They accept Australian online players, and they also allow you to use Australian Dollars (AUD) to make deposits and withdrawals. There is an excellent selection of games, both in terms of online pokies and table games. And it is backed by the most secure technology out there. Signing up at Red Stag is simple. Choose your username and password, then fill in details like your name, full address, birth date and phone number. Then you are all ready to go. It is really quite easy to sign up at Red Stag; the entire process should take two minutes, at the most. Of course, Red Stag comes with a great welcome bonus to attract Australian online casino players. You can receive a welcome bonus of $2,500, along with a maximum of 500 free spins. This welcome bonus is spread out over seven deposits (with a minimum amount of $25 AUD), and the free spins are allocated over seven different games. This comes with a 30x rollover requirement, so read the terms and conditions prior to making a deposit. There are also weekly casino bonuses on Monday, Thursday and Saturday, along with banking bonuses for Bitcoin and Neosurf. Finally, there is the VIP Club, where you earn points for playing, and those points move you through the six tiers of the program. The more you play, the more you earn towards moving up the ladder. Each tier has different perks that you would be wise to take advantage of. 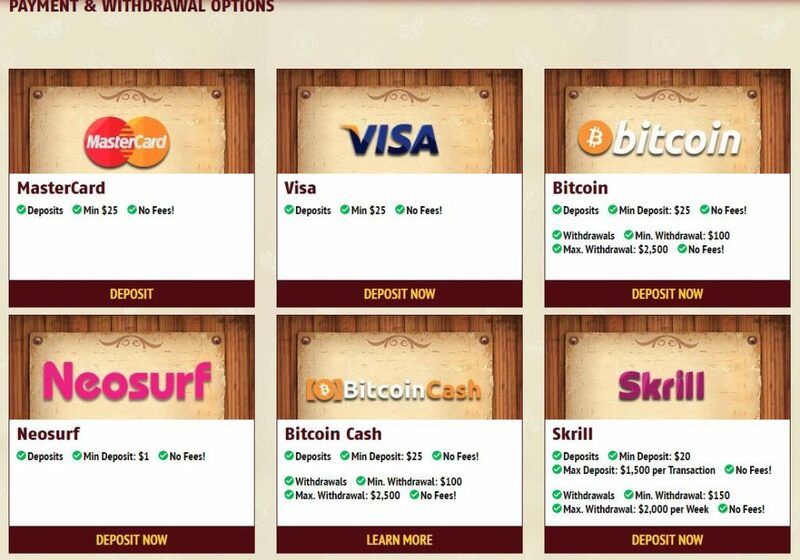 All withdrawals are processed within 72 business hours. There are also no fees, with the exception of cheques. Those cost $30 and take about 5-7 business days. You will be to find all the casino games that Red Stag has to offer you very easily on the right side of the home page. They are broken up into categories, such as 3-reel slots, video slots, video poker, blackjack, table games and progressive jackpots. You can also save games under ‘My Games’, so it is even easier to find your favourites. There is also an option to enter tournaments on the navigation bar, and under the ‘Others’ option, you will find Keno and Reel Poker Slots, which is a combination of 3-reel slots and video poker. One neat feature that Red Stag comes with is the ability to play a downloadable version of their casino, or you can simply log in on a browser to play. However, with the downloadable version, you have the option to play for free, instead of betting real money. You can find free versions of some games on the web-based version, and sometimes if you are out of money in your account, you will be directed to a free play version of the game. Test out the downloadable version for games that you might not be familiar with and want to get some practice in before you start playing for real money. The downloadable casino will not take up much room on your laptop or desktop. Red Stag runs their casino on WGS Technology software, which has been providing the best online casinos with games for a very long time now. Between their usual assortment of table games and online pokies, and their progressive jackpot games and tournaments, players should have no problem finding games to their liking. You can play Red Stag on the go on your mobile device, whether it is a smartphone or a tablet. Red Stag can be played on Apple, Android and Windows devices as well. The casino runs extremely smooth for a mobile casino, and you have access to most of the games that you would find on your desktop or laptop. Security is one of the biggest fears that new players have when it comes to joining an online casino. Red Stag knows that, that is why they have equipped their casino with the best of the best SSL encryption technology. This means that your financial and personal information is completely safe, and they are always working to make sure that is the case. You will also have to send a few documents to verify your identity, such as photocopies of your driver’s license, credit cards that will be used at the casino, statements, and others. However, it is all for your safety and security. As for the games, they are regularly audited by a third-party agency. This insures that the games you are playing are 100% fair, and everyone has the same chance to win big money! The customer support group at Red Stag is incredibly knowledgeable and friendly, and you should receive a response very quickly. You can reach them by live chat, which is growing in popularity among online casino players. This is available 24 hours a day, seven days a week. You can also call a toll-free number, 1-888-281-3640, and you can email support@redstagcasino.eu. You should always have your account number ready, just to make the process easier. Even though it is new by online casino standards, Red Stag Casino has shown that they have the chops to be a player in the game for a long time to come. The welcome bonus alone makes Red Stag worth checking out, but you will stay for the other promotions and the fine selection of games at your disposal. Furthermore, the folks at Red Stag are always working on ways to improve their services, so if you have any issues, do not hesitate to contact them. Red Stag Casino is definitely a casino that you should have on your radar, whether you are a serious online casino player or just looking to have some fun.